This THP is about 3 miles NW of Arnold, CA and Highway 4 near the South Fork of the Mokelumne River. 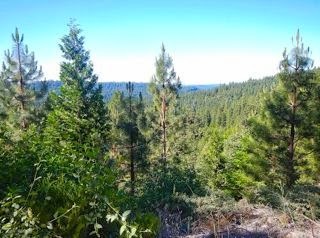 Sierra Pacific Industries is planning a mostly clearcut tractor and cable logging operation in ponderosa pine, sugar pine, white fir, Douglas fir and incense cedar forests at an elevation of 3,000 to 4,700 feet. Several prominent swales are located inside units 1770 and 1099. SPI is planning to use excavators for fuels work on slopes greater than 30% that lead without flattening into a class II watercourse. There are also 2 oversized units, and 89 acres of so-called operational buffers outside of units to be used for skid trails, landings and for fire line construction. The Irish Creek goshawk territory is located within 1,600 feet of THP units. More information is available on the THP Tracking Center website. Some of the proposed harvest areas are poorly stocked and overgrown with manzanita. I am thankful that SPI is going to restore the growing potential of the site while at the same time reducing the fire danger.